Wayne Knox, 92, went to be with his Lord and Savior on Monday September 10, 2018 surrounded by his family. Funeral: 10:30 a.m. Thursday in Biggers Funeral Chapel with David Garvin and Roy Deaver officiating. Wayne was born November 30, 1925 in Justin to the late Leonard Franklin and Ella Dee Knox. He married Betty Jackson on November 21, 1946 in Justin. Wayne was a farmer and rancher in the Haslet area for 70 years. He served on the first volunteer Haslet Fire Department. Wayne also served as the Mayor of Haslet. 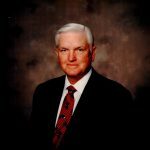 He served 26 years on the Tarrant County Farm Service Agency Committee and seven years as a director on the Federal Land Bank. Wayne served faithfully as an elder at the Haslet Church of Christ for 50 years. He loved his family, farming and ranching. Wayne was preceded in death by his parents; daughter, Becky Carroll; one brother; and two sisters. Wife of 71 years, Betty Knox; sons, Mike and Roger Knox; grandchildren, Cory and Cody Carroll, Stacy Toki, and Blake and David Knox; great-grandchildren, Lily and Case Carroll, and Aidan and Laine Knox. Betty and family—thinking and praying for each of you in the loss of Wayne. Such a “good and faithful servant” (Matt 25:21). We will always remember the sweet, kind couple who were our mentors in our early marriage. You’ve been such a blessing to so many....love to each. Celebrating the life of such a good friend of my parents, Bill and Jean Tindle. Praying you will also have fond memories of all the times they shared. May God's peace and comfort surround you. Keeping the Knox family in our thoughts and prayers as you grieve a great husband, father, grandfather, great grandfather. May the Lord give you peace.